Plus guest appearances by Seve, Mommy Pinty, and Direk Paul. They've done it again! Alex Gonzaga posted a new entry on her YouTube channel featuring her sister Toni and they're giving us all the LOLs. 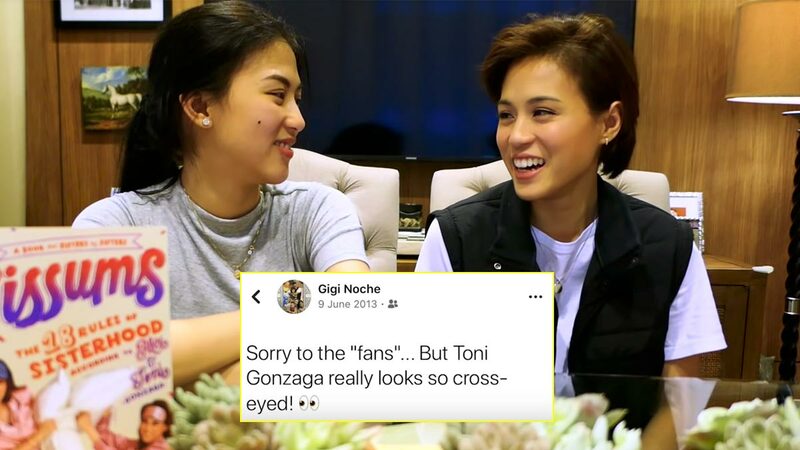 The video, sort of like an episode of Jimmy Kimmel's Celebrities Read Mean Tweets, shows the Gonzaga sisters reading "harsh" comments about them from Facebook, Twitter, and YouTube. Toni said, "dapat serious tayo, kasi ano 'to, harsh comments. Kailangan 'to hurtful." There were comments on Toni's acting, Alex's hosting skills, jabs at their physical appearance, even quips comparing the two sisters by saying one is better than the other. "Obnoxious," "entitled," and "snobby" are just some of the adjectives that come up. Alex and Toni handled it well, mostly brushing off mean words, adding fuel to the fire by agreeing when someone says mean things about the other sister, and, overall, just defending each other. They got real about celebrities having to smile all the time, the challenges of acting and hosting, and people judging others based on physical appearances. Alex and Toni recently released a book about sisterhood called Sissums.